Village Signs is a series of caches based on the ornate signs that depict the heritage, history and culture of the villages that put them up*. This cache is a traditional cache placed close to the village sign, parking is also available close by GZ. 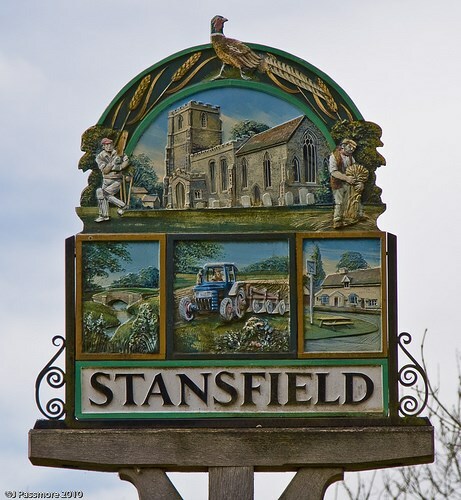 Stansfield is a thriving village community situated amidst the undulating countryside of south-west Suffolk, approximately 5 miles north of the historic town of Clare and 11 miles south-west of Bury St. Edmunds. Other notable towns and villages nearby include Cavendish and Long Melford. The parish lies within the borough of St Edmundsbury and includes the hamlet of Assington Green. The surrounding countryside offers outstanding walking opportunities including the Bury to Clare Walk which passes through the village. The village population of approximately 250 is served by an active village hall, cricket pitch, playing field and church. If anybody would like to expand this series please do. I would just ask that you letSmokeypugs know first so they can keep track of the Village Sign numbers and names to avoid duplication.